After an extended development phase in which the new LP shelf was tested packed with records through its paces, it's finally here: We are pleased to present the record shelf ORWE made of birch plywood in semi-gloss white! 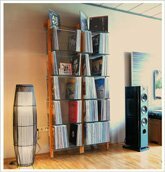 With almost 2m height and a width of 1.05m ORWE can hold up to nearly 1120 records and therefore offers sufficient space in particular for all the vinyl treasures of record-collectors. ORWE is now available in the online shop as a base module with 14 compartments! 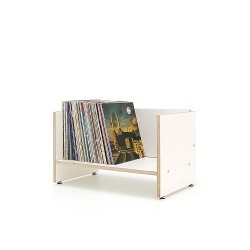 Extension element for the shelving unit ORWE - the spacious Record Shelving unit made of high quality and sturdy plywood in white with colorful back walls. 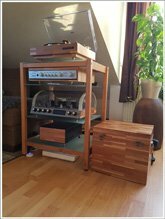 With a height of almost 2m and a width of 1,05m the ORWE main module fits up to 1120 LPs and therefore provides lots of storage space especially for vinyl collectors. 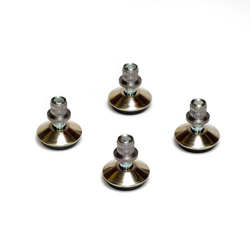 With adjustable furniture feet for optimum stability. Available now - the ORWE extension module with 9 compartments. Extend your ORWE main module by another 2 rows of shelves and create a storage wall to your liking. QUADRA storage shelving unit for invisible wall mounting. With 6 security glass panels. 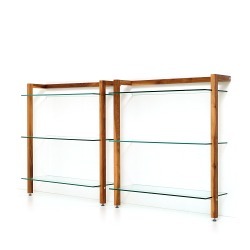 Slender, graceful shelf - made of massive cherry wood, glass and aluminium. The frame is wall mounted by invisible fittings and holds 6 large tempered safety glass panes. The slender construction and unobtrusive design allows deep insight into the shelf and provides lots of storage space. 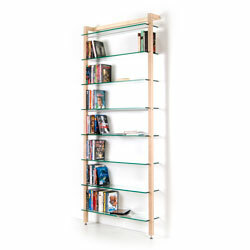 DVD shelving unit or bookcase. 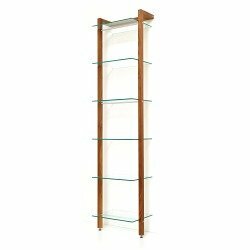 The QUADRA DVD shelving unit is made of solid cherry wood with 8 large glass shelves and provides plenty of storage space for your DVD collection or pocket books. The high-quality materials are combined to form a slender, large-scale DVD shelf or bookcase made of solid wood for your living room. QUADRA storage shelving unit for invisible wall mounting. With 6 security glass panels. 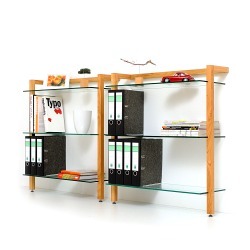 Slender, graceful shelf - made of massive ash wood, glass and aluminium. The frame is wall mounted by hidden fittings and holds 6 large tempered safety glass panes. 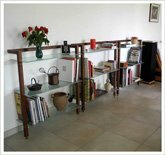 The slender construction and unobtrusive design allows deep insight into the shelf and provides lots of storage space. Suitable for folder, books, storage boxes or collector's items. Also available in cherry and walnut wood. DVD shelving unit or bookcase. 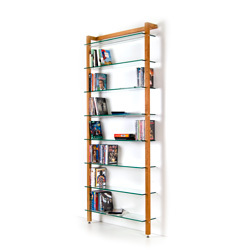 The QUADRA DVD shelving unit is made of solid ash wood with 8 large glass shelves and provides plenty of storage space for your DVD collection or pocket books. The high-quality materials are combined to form a slender, large-scale DVD shelf or bookcase made of solid wood for your living room. 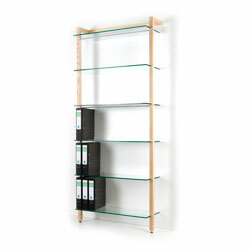 QUADRA LP storage shelving unit for invisible wall mounting. With 6 security glass panels. 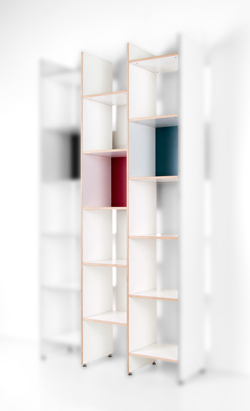 Slender, graceful shelf - made of massive cherry tree wood, glass and aluminium. The frame is wall mounted by invisible fittings and holds 6 large tempered safety glass panes. 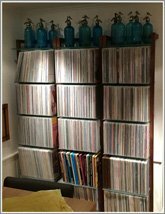 The slender construction and unobtrusive design allows deep insight into the shelf and provides lots of storage space for your LP collection. QUADRA storage shelving unit for invisible wall mounting. With 3 security glass panels. 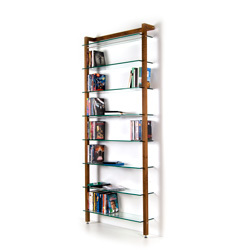 Slender, graceful shelf - made of massive cherry wood, glass and aluminium. The frame is wall mounted by invisible fittings and holds 3 large tempered safety glass panes. 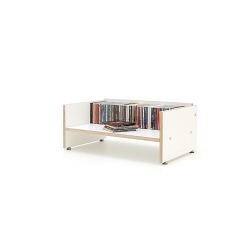 The slender construction and unobtrusive design allows deep insight into the shelf and provides lots of storage space. QUADRA storage shelving unit for invisible wall mounting. With 3 security glass panels. 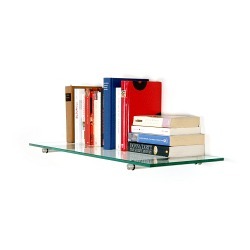 Slender, graceful shelf - made of massive ash wood, glass and aluminium. The frame is wall mounted by invisible fittings and holds 3 large tempered safety glass panes. The slender construction and unobtrusive design allows deep insight into the shelf and provides lots of storage space. 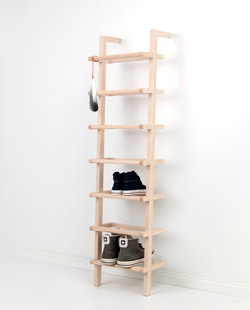 High narrow shoe rack to lean on the wall. Perfect for short or narrow corridors. No permanent installation necessary. Can be used on all smooth, straight surfaces ajar (even outside of cabinets or similar). Solid ash, untreated, shoe horn made of metal. 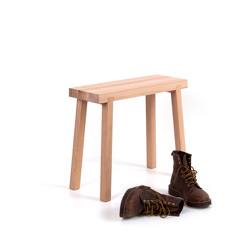 Bench stool in oak. Ideal for the hallway or living area. Puristic design for your home entertainment center. 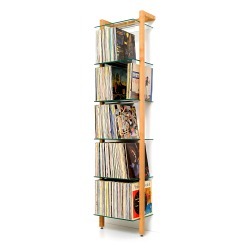 Clear-cut stackable hi-fi rack for your media devices such as hi-fi units, record player, vinyl records, books or DVDs. The hi-fi stand ROADIE is available in two different sizes which can be stacked according to your needs - no bolting necessary! With optimized backs for cables and circulation. Available in plywood with white melamin finish. 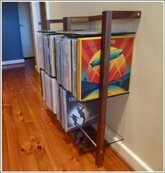 Hifi shelf ROADIE II (high version) - fitted for hi-fi units, vinyl records, books or as shoe rack. Puristic design for your home entertainment center. 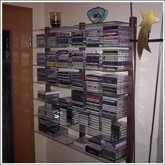 Clear-cut stackable hi-fi rack for your media devices such as hi-fi components, record player, CDs or DVDs. 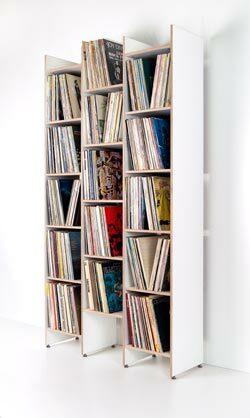 Hifi shelf ROADIE I (low version) - fitted for audio components, magazines, CDs or as shoe rack. 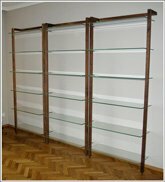 Set consisting of a pair of clear-cut shelf supports made of stainless steel and a glass shelf made of tempered clear glass. 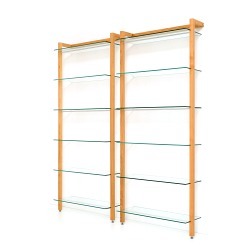 Set contains 1 pair of shelf supports and 1 glass shelf. 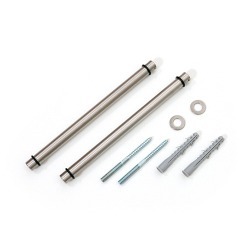 Clear-cut shelf support made of stainless steel for wall mounting. Suitable for consoles made of wood or glass. 2-pieces set. Delivery without shelf.